Limited Edition Shoe. 3rd Annual Metal Shoe Made in Pewter and Signed by the artist Riane. Size: 4 inches Length +-. Minature Collectible Shoes by Just the Right Shoe by Willitts Designs. Size: 4 inches Length +-. Minature Collectible Shoes by Just the Right Shoe by Willitts Designs. 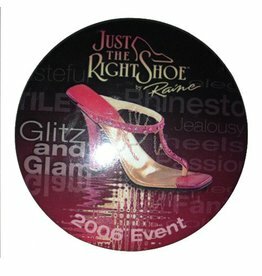 ust the Right Shoe Glitz and Glam 2006 Event Button. Size: 2 inches dia. Minature Collectible Shoes by Just the Right Shoe by Willitts Designs.